The cast of Circle Players' Fame Forever performing the now-classic Tony-winning theme song. Those in attendance this past Thursday night for Circle Players' opening night of Fame Forever: Talent Springs Eternal not only witnessed the South East US debut of the play, but were also part of an audience with David De Silva who produced the original Tony-winning 1980 FAME movie and the subsequent long-running TV series. De Silva also conceived and developed both theatrical stage versions, Fame: The Musical and Fame Forever. Adding to the authenticity of the production, for the first time in Circle Player's 63 year history, the company set up house at MTSU's Tucker Theatre, the recently renovated centerpiece of the Murfreesboro school's theatre program. Opening night attendees even got an unexpected school days deja vu when, just moments before show time, a fire alarm sounded and everyone had to evacuate the auditorium. Luckily the pre-show alarm didn't "light up the sky like a flame". It seems the fog machines set off the newly updated alarm system. Once back inside, the audience settled in for a wonderful night of live theatre which began with Tim Larson, President of Circle Players and director of the current presentation of Fame Forever. Tim welcomed everyone and introduced the night's honored guest, David De Silva, as well as Rutherford Country Mayor, Ernest Burgess. Mayor Burgess then presented De Silva with a proclamation declaring Thursday, July 21 David De Silva Day. With that, it was showtime. Fame Forever is a musical sequel of sorts that reunites characters from Fame: The Musical for the 20th class reunion of New York's High School of Performing Arts, Class of 1984. For those, like myself, who saw Circle Players' 2009 production of Fame: The Musical, this latest incarnation not only reintroduces familiar character, but with some clever casting, showcases a few familiar faces from Circle's 2009 show, albeit mostly in new roles. Among the familiar faces is Faith Kelm as Carmen Diaz, well sort of. You see, Carmen died of a drug overdose near the end of Fame: The Musical, but appears in Fame Forever as an other-worldly Carmen transitioning from human form to the afterlife. In a plot point straight out of It's a Wonderful Life, Carmen is greeted by Michael Peters (Caleb Reynolds). Reynolds was also featured in Circle's Fame, but as a different character. If you recognizePeters' name, it's because there really was a Michael Peters. The late master choreographer worked with everyone from Michael Jackson (Thriller) andMichael Bennett (A Chorus Line) to Debbie Reynolds and Bob Avian (Dreamgirls). The inclusion of Peters' name in the play is an obvious homage from De Silva, considering the fact that in real life, Peters actually attended New York's High School of Performing Arts. However, if you're expecting an African-American actor to play Peters, too bad. As he should, Larson cast Reynolds and other actors for their talent, not their skin color. In the role of Peters, Reynolds continues to show he's growing as an actor, having appeared in Circle's most recent show, A Chorus Line, as well as the aforementioned 2009 production ofFame. Kelm as Carmen also continues to grow as both an actress and singer/dancer. When I reviewed Circles' 2009 Fame, one of my only disappointments was in the lack of consistency with accents and dialects. Wisely director Larson decided to forego conveying ethnicity through accents, therefore allowing his casts talents to speak for themselves. Together for Around and Around, the show's opening number, Kelm and Reynolds definitely start the show off on the right note. While the the majority of the tunes featured in the play may not be as much of an earworm as the original theme song, thanks to the capable cast, they manage to keep the audience tuned in throughout the show. Aside from Kelm reprising her role as Carmen, the rest of the familiar faces, like Reynolds, are playing different characters, but it's been two years since Circle mounted Fame: The Musical, so don't let worry you. Remember, Fame Forever is set 20 after the original stage play, so Larson opted to cast returning characters with mostly age-appropriate actors. As always, Jamie London steals nearly every scene in which she appears. Cast this time as Mrs. Greta Bell, who now seems to be more of a school secretary that a dance teacher, London is at her funniest late in the show when she appears a bit tipsy at the reunion. O the subject of scene-stealers, young Noah Rice (last seen in Circle Players' 13: The Musical) is funny without being offensive as the stereotypical gay kid. His inclusion in the musical number "Everybody Wants to Be Maria"-- Yes, the Maria of West Side Story, as it's the show-within-a-show the current class at the Fame school is producing--is quite hilarious. Cat Eberwine is cast as adult Serena Katz, who since graduating in '84 has returned to the school as a teacher. Eberwine's Serena offers a bit of humor and humility as she reconnects with one-time school crush, Nick Piazza (Trey Palmer), now a big TV star. Her solo on Love Is Rare is another of the show's memorable musical moments. Eberwine also serves as the shows costumer. Her talents as a costumer are a main feature of the show's finale as she stays true to original production notes by conveying the never ending circle of life and unending memories of those gone before us with the seemingly simple use of two colors accentuated by particular attention to detail. As for the new class at New York's School of Performing Arts, or PA, there's a love triangle between best friends Vanessa (Mallory Gleason) and Georgia (Tyler Clarke Kennedy Samuel) and the object of their affection, JJ (Daniel Collins). Each of the girls shines during The Miracle Is Me and I've Got Another Song to Sing. Tyler, who is currently studying voice at the University of Evansville belts it out during an unexpected, but thematically fitting performance of George Bizet's ariaHabanera from the opera Carmen. LaToya Gardner, who played Greta Bell in Circle's 2009 Fame, is recast as Mabel Washington a former student who just so happens to be Georgia's mom. It's during one of LaToya's numbers that choreographer Kate Adams-Johnson offers faithful Circle patrons a bit of a wink and a nod. Astute Circle audience members will recognize the revolving staircase staging from The Teacher's Argument, a personal favorite number from Circle's 2009 Fame during Gardner's duet with David Arnold Joe Vegas/Vanessa's father on It's In Her DNA. 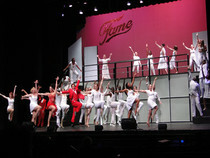 Kate's choreography also shines during one of Fame Forever's most somber and touching sequences. While other productions of Fame Forever have presented a more literal funeral sequence near the end of the show, the suggestion of a funeral is beautifully conveyed by Kate's choreography utilizing dancers dressed in black carrying black umbrellas. Acknowledging a hereafter, Carmen seemingly floats above the other dancers dressed in angelic while and carrying a white umbrella. Brilliant! Like Eberwine, Kate also takes on double duty for Fame Forever. In addition to overseeing choreography, Kate also appears in the show as former student and dancer,Iris Kelly-Thompkins. Her Takes 3 to Tango alongside Max Désir as Tyrone Jackson and Kathryn Clubb'sChantelle is the perfect mix of seductive and comedic as the two women vie for Tyrone's attention by way of the dance. Kudos to Randy Craft, who is also currently in rehearsals as pianist for Chaffin's Barn's upcoming production ofAnnie, As Carmen's former musical collaborator Schlomo Metzenbaum, Craft actually tickles the ivories onstage during a couple of the show's musical numbers. Aside from Craft's on-stage piano playing, the remainder of the show's musical highlights are performed by the show's house band, skillfully guided by Music Director, Ginger Newman, on loan from The Larry Keeton Theatre. Among the other notable musical numbers: a modern take of the original theme song featuring a rap performed by young Alex Vegas (played at alternating performances by Eric Williams and Jack Williams). By featuring this young character, the recurring theme of rebirth and renewal sets things up nicely for yet another future visit to the Fame school. Of course it wouldn't be Fame without the literal show-stopping original theme. To that end, the entire cast re-emerges for their curtain call at show's end with Kelm leading them in the Tony-winning signature song. Circle Friends, the non-profit organization who's primary focus is to raise money by way of community outreach to spread awareness of Circle Players' programs and productions, hosted a post-show cocktail and dessert event where patrons had the opportunity to meet members of the cast and crew, including LaTonya Turner, Circle Players VP and producer of Circle's production of Fame Forever. There was also opportunity to chat with the night's honored guest, David De Silva. Thanks to the watchful eye of De Silva , affectionately known as Father Fame, along with theatre lovers like Larson, Adams-Johnson and Turner, as the all-too-familiar Fame theme song and the title of the sequel musical suggests, Fame will indeed live forever! Fame Forever concludes its limited run with two performances remaining. Saturday, July 23 at 7:30pm and Sunday, July 24 at 2:00pm. Tickets are available online or at the box office one our prior to showtime.